In 1944, when she was only 6 years old, Yael was deported to one of the Nazis‘ death camps where she not only had to watch her family and friends die but also was abused as a research object by a mad Nazi scientist whose experiments made her suffer even more. But Yael survived torture and tragedy and managed to escape from the camp to join the secret resistance against the National Socialists. What if the Hitler and the Axis Powers had won World War II? What if Adolf Hitler had won World War II and still ruled the world in 1956? This is the scenario of Ryan Graudin’s historical fiction novel „Wolf by Wolf“ in which she creates an alternate world where the world is under the rule of the Axis Powers, Adolf Hitler’s Nazi Germany and Emperor Hirohito’s Imperial Japan – so far, so terrifying. But here comes the fun part: The Third Reich and Japan invented an annual motorcycle race to celebrate their victory and show the world the vast extent of their common territory. The so-called Axis Tour starts in the Nazis‘ „World Capital Germania“ (former Berlin) and leads through Europe, Western Africa and Asia until it ends in Tokyo where the winner gets awarded not only with an Iron Cross but also with an invitation to the Victor’s Ball including an audience with the Führer itself. One of the participants is Graudin’s protagonist, the Jewish girl Yael who is a former death camp prisoner and is now fighting for the resistance with the aim to bring an end to Hitler’s reign of terror. Of course as a Jew she’s at the risk of ending up in death camp again if the Nazis find out about her but Yael is also a shape-shifter so that she steals the identity of former Victor Adele Wolfe and races in her place. Win the race. Kill Hitler. 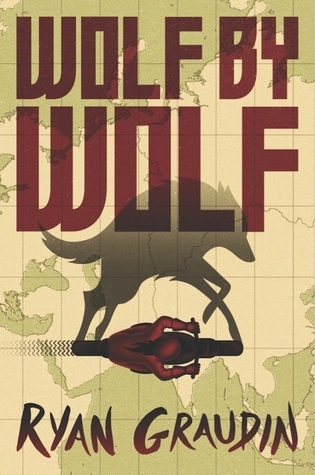 Epic motorcycle race, killing Hitler, skinshift powers – when I first heard about „Wolf by Wolf“ I was almost immediately intrigued by Ryan Graudin’s idea, especially because the book often got described as „Inglourious Basterds“ meets „The Hunger Games“, so I had very high expectations for a crazy and awesome novel. Unfortunately the scenario turned out to be pretty much the only thing about this book that I really loved while the story itself soon became quite a huge disappointment. Let’s start with the race which is supposed to be the main part of the book. The concept of the Axis Tour sounds pretty exciting and even though there are the usual „don’t kill someone“ rules it quickly becomes quite clear that the contestants would give everything for the victory. BUT: the race is completely boring and only a minor part of the story takes places on the actual track while most of the „action“ happens at the checkpoints in between. So if you’re hoping for thrilling action scenes on the road and fierce motorcycle fights then let me tell you that the actual racing parts usually don’t take longer than a handful of pages. Second: the race seems more or less random because the riders apparently can race whenever they want and at the end of the stage some checkpoint operator throw’s some random times on the scoreboard which doesn’t make the race very interesting and comprehensible. Third: In theory there are so many exciting places on the route like Prague, Rome, Cairo, Baghdad, New Delhi or Shanghai but you never actually get to experience them because Ryan Graudin completely fails at making you feel those places. There are almost no descriptions of the cities and often the only indication for the current location is that the author TELLS you where they are right now or because it’s mentioned in the chapter headings. That’s pretty disappointing because for me it took away a lot of the fascination about the Axis Tour. The same can be said about the rest of the worldbuilding which was just SO superficial. I actually never had the feeling that I was diving into a world that is ruled by terror, hate and racism because there’s so little historical background in the story. I know this might sound a bit provocative but I sometimes asked myself why the resistance wanted to end Hitler’s rulership in the first place. I mean of course everybody knows that Hitler was a monster and that his regime killed millions of people but hadn’t I known this before then I would barely have noticed what’s so wrong about a world where Nazi Germany and the Imperial Japan rule because again, Ryan Graudin never makes you feel the terror the Third Reich spread over the world. Yes, there are some short passages that tell how Yael grew up in the Nazi death camp but in my opinion the author didn’t succeed in providing these scenes with a lot of emotions. For me almost the whole worldbuilding was based on TELLING instead of SHOWING and that’s not the way it should be in a novel that has such a delicate historical background. Let’s also talk about the characters which I found just as superficial as the worldbuilding. It already starts with Yael who is one of the most boring protagonists I’ve read about in a while because the only things that make her interesting are her background as a death camp survivor and the fact that she’s a skinshifter. I’ve already mentioned above that I didn’t find the flashbacks into Yael’s past very intense and unfortunately I was also disappointed by her „superpower“ which sounded interesting in the description of the book but for me it seemed to be just a convenient tool to let the protagonist solve her problems rather effortless and this leads me to another aspect about the novel that I found quite annoying: The story is already super simpel and without any actual depth but when there finally appear some obstacles in Yael’s way to fulfill her mission then it usually only takes her one or two pages to get out of those dangerous situations again. In this story there are usually to ways to solve a problem: a) skinshifting b) something completely unrealistic happens like people suddenly behaving irrationally or someone (usually NOT Yael herself) comes up with a magical solution like „well, you didn’t know that I secretly tuned your bike so it’s no problem to catch up again“. Since everything is so simpel and often also quite ridiculous this story soon becomes pretty boring because I never had the feeling that Yael’s mission could not be successful in the end so there was almost no suspense at all for me. If you thought that David from Brandon Sanderson’s „Steelheart“ already sucked at metaphors then you can look forward to Ryan Graudin’s because some of them were even worse. Want a sample? „The Roman checkpoint operator’s accent was mozzarella soft, balancing out the red frustration on his face“ – seriously, a „mozzarella soft“ accent? Maybe this was supposed to be funny because the character is Italian (haha…) but stupid phrases like this really pissed me off because there are just so many of them. If you write a book that is set in a country that is foreign to you and where the characters speak a language that is foreign to you as well then please don’t use words of this language just for fun because IT. MAKES. NO. SENSE. The characters are GERMAN who speak GERMAN so if you write their dialogues there’s no need to emphasize it with GERMAN words to show that they speak GERMAN because IT’S THEIR NATIVE LANGUAGE and you can’t talk „double German“. I found this already annoying in „The Book Thief“ because it’s completely redundant, especially if it’s done WRONG since phrases like „No Scheisse“ really hurt when you’re a native German speaker. And there’s „Scheisse“ everywhere so maybe Graudin just really likes German swearwords? 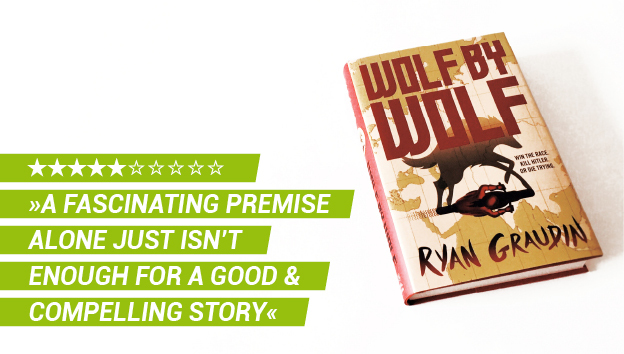 Ryan Graudin's alternate history novel "Wolf by Wolf" comes with a fascinating premise and all the ingredients for a great YA novel but the flat characters, the predictable story that almost completely lacks any suspense and the disappointing world building made it quite a disappointing read for me. I’m so glad you wrote this review, because it was way more entertaining than the book. Your list of animal name friends was my favorite part. xD I guess the book made me laugh, too, but I was laughing at it instead of with it. I really don’t understand how Graudin’s editor let her get away with all those food metaphors (Nice shoutout to David, btw) or the ridiculous German usage. Part of me is curious about the sequel – it’s got a great title and cover, and it can’t get any WORSE – but I don’t see how it can get much better, either, especially since I don’t feel any connection to the characters.